There's an ostrich farm just on the outskirts of Escondido, CA, south of where I live, and there's also a number of roadside stands around there selling this brand of Big Bird Jerky. I don't know if the farm is behind the Big Bird brand, however. The brand is apparently owned by Stehly Ranch and Feeding Co., based out of Chowchilla, CA. A lookup of the company shows that it's a one-man operation. I tried to call him up, but got no answer. 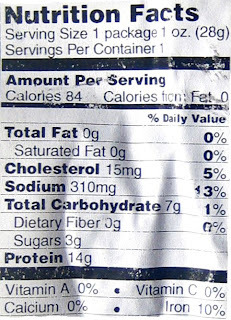 The jerky itself is manufactured by Glenoaks Foods, Inc., based out of Sun Valley, CA. Glenoaks owns the J.C. Rivers brand of jerky, and they also make the Ring of Fire brand of jerky that I reviewed earlier. Interestingly, this package of Big Bird Jerky has the words "Ostrich Biltong" on it. If you read my previous review of Big Bird's teriyaki variety of the same, you'll know that I really didn't find anything about this resembling true biltong, though I'll condition that by saying the lines separating biltong from jerky are blurred. I think however, ostrich is perhaps more associated with biltong than it is with jerky. Ostrich, water, soy sauce, brown sugar, pineapple juice, black pepper, liquid smoke, garlic powder, white pepper. The taste I get from the surface of these pieces starts with a slight sweetness, followed by a faint bit of the soy sauce. Moving into the chew, the black pepper comes through first, with some natural meat flavors coming next. Sucking out some of the juices, I can get more soy sauce flavor. Overall, it's a tasty jerky, with a good concentration of flavor. But I'm not sure I'd call this biltong. This has a very classic jerky taste, nothing that resembles biltong. Being that this is advertised as a "Western" variety of jerky, it's difficult to determine what exactly it ought to taste like. But as with the "cowboy style" of jerky, it should have an intense flavor, lots of salt, smoke, garlic, pepper, and natural meat flavors. You gotta figure the cowboys and lawmen of the old west era had burnt out their tastebuds from too much tobacco and whiskey. So they need a jerky that offers a ton of taste. 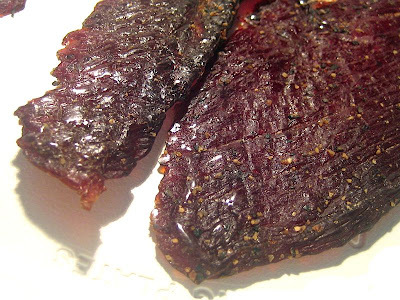 While this jerky is indeed peppery, and has a good deal of soy sauce flavor, it's light on everything else. I'd say the soy sauce is the primary flavor of this jerky, followed by the pepper, and then I'd give the surface sweetness the third most prominent taste. The natural meat flavors are slight, and being preservative free, it's still a fresh taste. Ostrich tastes pretty much like beef, it's just lower in fat. But still, considering it's ostrich, you'd expect to get a lot of natural meat flavors just so that you can enjoy ostrich. Otherwise, why would anyone buy it? It is indeed lower in fat, but in this 1 ounce package you won't realize much health advantages. The saltiness is moderate at best. The garlic powder mentioned in the ingredients list is also very slight, I don't really taste much of it, except maybe as part of the soy sauce. I don't even get much smokiness. Overall, it's another good tasting jerky, nothing bad to report here. But it's another jerky that doesn't really come out and grab my attention. It's mostly a novelty jerky for being ostrich and being labeled as "biltong". These appear to be slices of whole meat, sliced average thickness, and in small, medium and large sized pieces. 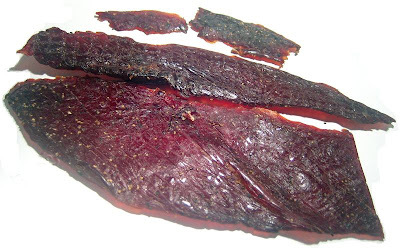 This is a dry jerky, but one that retains a lot of flexibility. It also requires a bit of effort to tear off a strip, and is somewhat on the chewy side. It doesn't quite provide a chewing experience like a real steak, but it's not mushy at all. Instead, it gets slightly gummy. It's for the most part a clean jerky, leaving no residue on my fingers, but it does drop a fair amount of black pepper resulting from the effort exerted in tearing off a strip. I found no amounts of fat, tendon, or gristle on these pieces. I paid $3.49 for this 1 ounce package at a roadside stand located between Valley Center and Escondido, CA, along Valley Center Pkwy. That makes this a very expensive jerky. For general jerky snacking purposes, it's a poor value. And that's largely due to its high price. Otherwise, it provides a good taste, and I actually do find it snackable. The meat consistency is ok, though somewhat tough, and somewhat gummy. For being advertised as biltong, it's a poor value. I don't really see this as biltong, everything here suggests it as classic jerky in both taste and consistency. Even as a western style of jerky, it's a poor value because I don't quite see this having the "western" or "cowboy style" characteristics that other similarly named jerkies have. I actually rated this one notch higher than the brand's teriyaki variety, and that's only because this provides more taste with the black pepper and soy sauce. Aside from that, I think this jerky really misses the mark for being advertised as biltong, and doesn't quite live up to my expectations as a "western style" of jerky. The meat consistency is also not that great. I could have given it a good rating if it only had more natural meat flavor. But it's still a tasty jerky for its black pepper and soy sauce, and it's also preservative free if that's important to you. But unless you can find this priced in the low $1.00 range, I wouldn't buy it again. But if you happen to have some of this jerky, my beer recommendation is a brown ale. This ostrich jerkey is the best! Can't wait to get more! I just finished one of this package. It is so delicious, I want to get more. I love how it is not as salty as other jerkey. And it is 100% Fat Free. I get the protein from a tasty snack! I remember we got it at a Ostrich farm right outside of Salvang, CA. You can't miss the farm on your way to the town of Salvang. It is on the same road.